The Harry Potter uniforms are quite charming. They're classic. They're timeless. But honestly, if you had to wear one three-fourths of the year for seven years, you might find them a little boring. Which is kind of odd because the Wizarding World can be a bit overwhelming sometimes. The day to day can be pretty confusing for the students. They have to juggle classes, extracurriculars, and homework that can sometimes be dangerous. Then there's the confusion of Hogwarts, itself. Students have to find their way through moving staircases and negotiate with the portraits guarding the portals. So if we think about it, kids who go to Hogwarts probably wouldn't have time to pick out a new outfit every day. Keeping the uniform simple was probably a good idea, in the end. And you could always shake things up with a good piece of magically themed piece of jewelry! 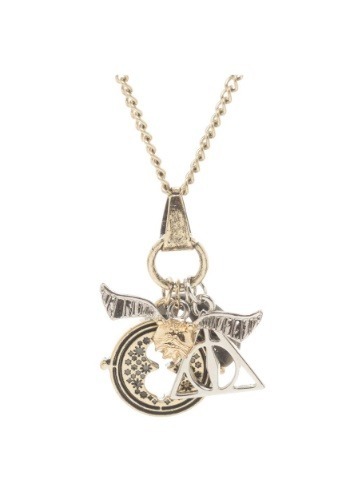 This Harry Potter charm necklace has a stylish mix of silver and gold, matching other accessories easily. 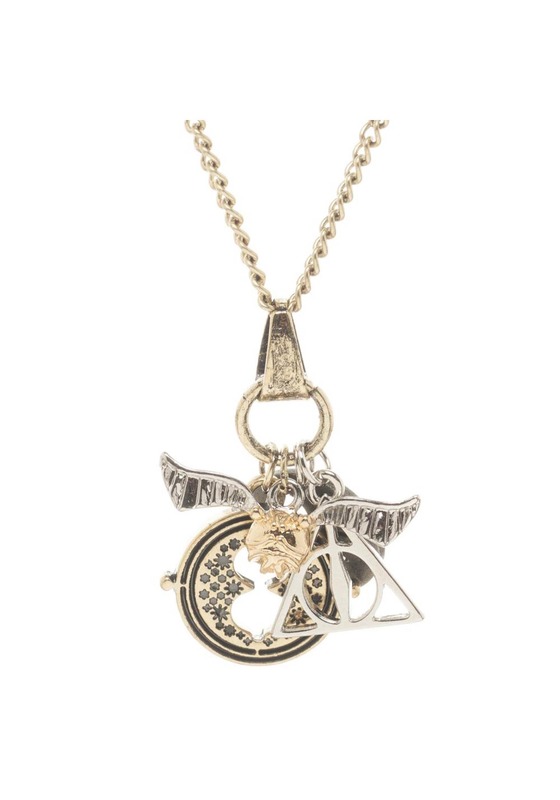 The symbols include Hermione's time turner, a golden snitch, and the Deathly Hallows sign. You'll love the way these charms represent the adventures of the Harry Potter series. Charming means something different altogether when you slip this necklace over your head. Whether you're dressing up as a Hogwarts student or you're heading out into the muggle world with a touch of magic resting on your chest, this necklace will be a gorgeous touch to your look! Standard Charm Diameter (largest) 3/4" 3/4"